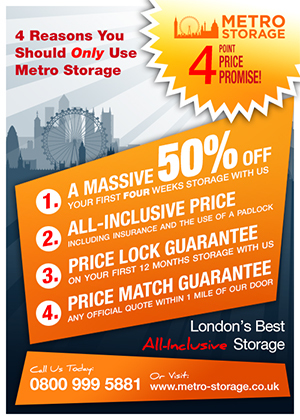 Whether you’re a business, student, or someone looking to free up some space at home, Metro Self Storage have the perfect self storage unit for you in Bayswater, Central London. We believe that storing your things should be simple. Our London storage costs are kept affordable, with simple pricing structures, and easy access to our W2 location. Why Choose Metro Self Storage? Save 50% – You’ll get your first 4 weeks half price. Free insurance – Saving you money and giving you peace of mind. Extensive opening hours 7 days a week – Access your unit as often as you like. Need Boxes, bubble wrap or tape? You can buy them onsite. Additional Discounts for pre-payment – Save up to 15% per year! Here at Metro Self Storage we understand that things change and you can’t predict the future. That’s why we offer flexible contracts so you can stay as little as just 4 weeks, or as long as you like. Just email us with 2 weeks notice and you can upgrade, downsize or cancel whenever you need to. Ensuring you always have the space you need and you don’t end up paying for space that you don’t. We like to keep things simple and fair. You won’t find any hidden fees or surprise invoices here! When you choose your unit you’ll be given a single price that includes everything you need, from padlocks and insurance to VAT. So the price you are quoted is the price you actually pay! Our aim at Metro Self Storage is to provide you with a simple, affordable and safe solution for your self storage needs. 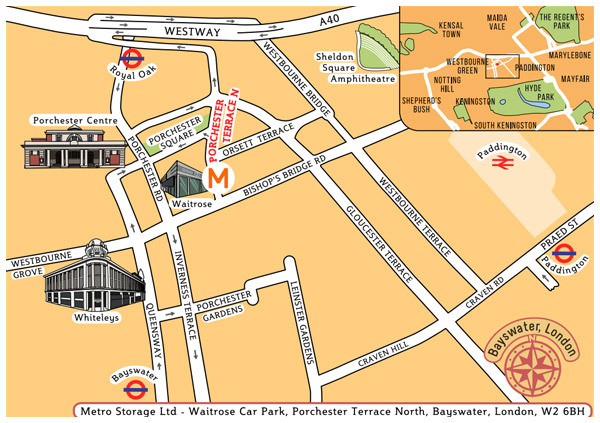 Our Bayswater Self Storage site is located in Central London. It has its own onsite car park and is close to Queensway, Paddington, Bayswater and Royal Oak underground stations. You can access your storage 7 days a week, Monday to Saturday 8am to 10pm and Sunday 10am to 6pm. There’s no need to phone ahead. Just come along and let yourself in to your unit. It really is like a “spare room on your doorstep”. Walk into Waitrose, take the lift down to the car park. Enter the car park from the lift lobby and go to signposted car park office. The onsite team will be delighted to look after you. Deciding how much space you need can be tricky. Choose a unit that’s too small and you risk not being able to fit all your stuff in. Go too big and you’re wasting money on space you don’t need. But there’s no need to worry. 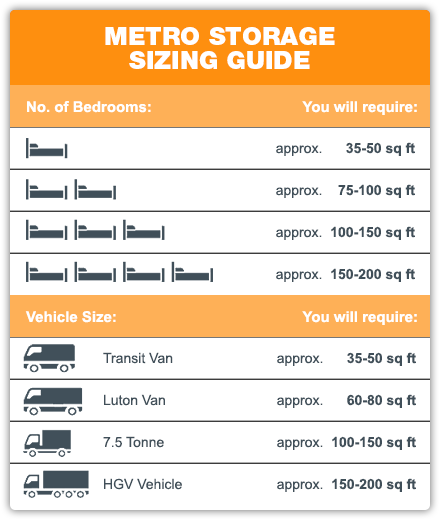 Our handy storage size guide will help you to understand how much stuff you can fit into each unit size, so you can choose the right storage unit for you. If you’re still not sure, just give us a call or pop in and we’ll be happy to show you some of our available units. And remember, with our flexible contracts you can upgrade or downsize whenever you need, so there’s no need to panic if you don’t get it exactly right first time. Need Some Help Getting Moved In? Whether you’re moving home or freeing some space up in the office, getting your stuff packed up and stored can be easy and hassle-free. Our “Easy Move” bundles give you everything you need to get moved in, from packaging, a packing service and bubble wrap to a man and van to do the heavy lifting. Just give us a call and we’ll take away the stress of getting moved in. Click the button below to get in touch and find out more about our self storage units in Bayswater, W2.